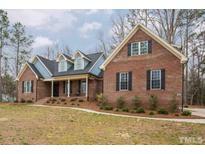 Below you can view all the homes for sale in the Chadbourne subdivision located in Garner North Carolina. Listings in Chadbourne are updated daily from data we receive from the Raleigh multiple listing service. To learn more about any of these homes or to receive custom notifications when a new property is listed for sale in Chadbourne, give us a call at 919-759-5792. Stunning executive all brick home featured in past Parade of Homes.This beautiful two-story home boasts Master & 2nd Bedroom on first floor,gorgeous mahogany kitchen cabinets&stainless steel appliances.A large central Family Room w/gas fireplace&handsome dining R.Large walk-in closets,huge bonus room w/wet bar & built-in audio system,tons of storage!Delightful back porch with a tastefully landscaped back yard w/fireplace surrounding a wonderful large 16x40 ft in-ground pool.Add’l detached brick 2-car garage.A must see! MLS#2249371. 297. You will love the community which features: Clubhouse, playground, tennis, pool, and more! MLS#2246861. 3435. EZ Screen porch. Patio. 3 Car Garage MLS#2241489. 4498. 2 great Patios for outdoor living! Storage Shed! MLS#2237475. 1647. Brazilian Cherry Hardwood flooring w/custom inlays, extensive moldings & 20' ceilings add to the elegance.Custom built-ins in Family Room.Upgrades include remodeled Kitchen in 2017, Master Bath in 2018,tankless gas water heater for endless hot water in 2018 & whirlpool tubs in all baths.Lovely sunroom!Raised brick patio w/brick columns overlooks professionally landscaped private lot w/night-lighting & wrought iron fencing.Great home for entertaining! Estate Living! MLS#2233111. 3836. Instant on hot H2O, ethernet, speakers throughout home, ATT Uverse, Power Back up hook up, security. MLS#2213842. 1128. The bedrooms upstairs are mini suites. MLS#2204280. 1130.